It’s a certainty that after the historically low interest rates, the Fed made the interest rates zero from 2008 until December 2015. This was in response to the crash of the inflated housing bubble that the Fed created with about 2 years of 1% interest rates. So this time the bubble has been inflated much more. Trillions of dollars in cheap money have fuelled the second-longest economic expansion in U.S. history, as measured by GDP. The market has been rising for nearly a decade straight without a 20% correction. It’s unlikely that this will continue beyond July 2019, as there as a never been a longer rise in US history. By historical standards, the current bubble will be crashed likely before that time. Since December 2015, the Fed has been steadily raising interest rates, roughly 0.25% per quarter. It’s just a matter of time that they will orchestrate a chain of events that could become the biggest crash in history, followed by a recession of major proportions. Around 84% Fed interest rate-hiking (16 of the last 19 times) have ended in a crisis. See some of the examples in the chart below. 1929 Wall Street Crash - The Federal Reserve’s easy money policies of the 1920s, created an enormous stock market bubble. In August 1929, the Fed raised interest rates and only a few months later, the bubble burst on “Black Tuesday”, when the Dow Jones lost over 12%. Between 1929 and 1932, the stock market lost 86%. 1987 Stock Market Crash - In February 1987, the Fed withdrew liquidity from the market; this made interest rates rise. They continued this until the “Black Monday” crash in October 1987, when the S&P 500 lost 33% of its value. 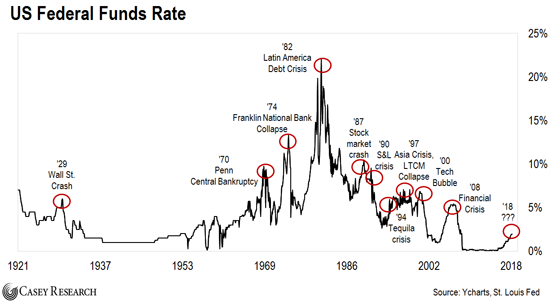 Asia Crisis and LTCM Collapse – By a period of relatively low interest rates, a bubble was created. Then in the mid-1990s, Greenspan’s Fed raised rates. This time the crisis started in Asia, spread to Russia, and then hit the US, where markets fell over 20%. Tech Bubble - Greenspan’s next rate-hike cycle helped to bust the tech bubble, which he’d helped to inflate with low interest rates. After the tech bubble burst, the S&P 500 was halved. In 1985, the US economic situation threatened the future presidential ambitions of Vice President George H.W. Bush. This was reason for a “rescue” mission. This time Saudi Arabia was used to run a “reverse oil shock” and flood the world oil market with “cheap” oil. The price of OPEC oil dropped from an average of nearly $26 to below $10 per barrel in only a couple of months in the spring of 1986. Wall Street economists proclaimed the final “victory”, while George Bush Sr. made a quiet trip to Riyadh in March 1986 to tell King Fahd that the oil price had gone down enough. 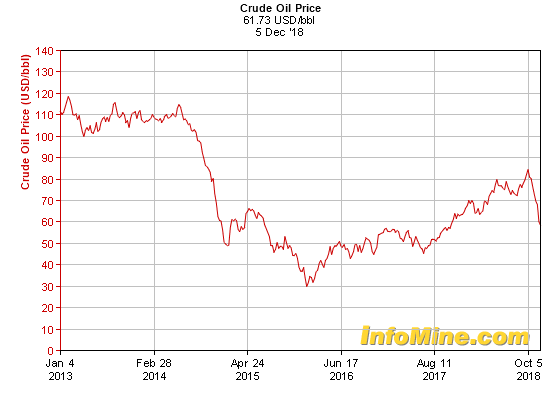 Saudi Oil Minister Sheikh Zaki Yamani was fired for a scapegoat and oil prices stabilized at the “low” level of around $14–16 per barrel. Speculation in real estate in the US continued at a record pace, while the stock market began a renewed climb to record highs. This 1986 oil-price collapse unleashed what was comparable to the 1927–29 phase in the US speculative bubble. Interest rates dropped even more dramatically, as money flowed in to make a “killing” on the New York stock markets. A new financial perversion became fashionable on Wall Street, the ”leveraged buyout”. Boone Pickens with borrowed money - “junk bonds” - bought controlling stock in companies, like Union Oil of California, or Gulf Oil, that were many times more worth than he had. If he succeeded in taking over a huge company with “borrowed money”, his debt could be repaid, while making a handsome profit. If the company became bankrupt, his bonds were just “junk” paper. During the last half of the 1980s, such actions consumed Wall Street and pushed the Dow upwards, driving corporations into the highest levels of debt since the 1930s depression. But this debt was not undertaken to invest in modern technology or new plant and equipment. After President Reagan signed the new Garn–St. Germain Act into law, he enthusiastically told an audience of invited S&L bankers, “I think we’ve hit the jackpot”. The new law opened the doors of the S&Ls to financial abuses and speculative risks as never before. It also made S&L banks an ideal vehicle for “organised crime” to launder billions of dollars from the booming narcotics business. Few noticed that it was the former firm of Reagan’s Treasury secretary Donald Regan, Merrill Lynch, whose Lugano office was implicated in laundering billions of dollars of heroin profits in the so-called “pizza connection”. Life insurance companies, began to speculate in real estate during the 1980s. By 1989, insurance companies were holding an estimated $260 billion of real estate on their books, in 1980 this had been $100 billion. Then in late 1980, real estate collapsed, forcing failures of insurance companies for the first time in post-war history. On 19 October 1987, the bubble burst. On that day the Dow Jones Index collapsed more than in any single day in history, by 508 points. Nakasone pressed the Bank of Japan and the Ministry of Finance to assist. Japanese interest rates fell lower, and lower, making US stocks, bonds and real estate appear “cheap” by comparison. Billions of dollars flowed out of Tokyo into the United States. During 1988, the dollar remained strong and Bush was able to secure his election as president. The plan of the new Bush administration was to direct pressures onto US allies for “burden sharing” of the huge US debt. If you buy $20,000 with loaned money, you could claim that your “personal GDP” is soaring, but in reality you would put your family in a precarious financial position. #1 US consumer credit hit another all-time record high. In the second quarter of 2008, total consumer credit reached a total of $2.63 trillion and in 2018 that has soared to $3.87 trillion (a 48% increase in 10 years). #2 Student loan debts have hit another all-time record high at more than $1.5 trillion dollars (an increase of almost 80% in 8 years). #5 Real wage growth in the US has recently declined by the most in 6 years. #7 In 2018, already 57 major retailers have announced store closings. #8 The size of the official US budget deficit is up 21% under President Trump. #9 It is estimated that interest on the national debt will surpass half a trillion dollars for the first time in 2018. A strange effect of the long-time historic low interest rates is that investors get more yield on the 3-year than on the 5-year Treasury note. Often state propaganda is being spread by our wonderful media on the “low” unemployment figures. We are for example told that unemployment in the US is only 3.8% - the lowest “in nearly 50 years”. The truth is that current unemployment isn’t “low” at all. For years, the US government has been taking numbers out of one category and putting them into another category. While the official number of “unemployed” Americans keeps going down, the number of Americans “not in the labor force” keeps going up. According to the Federal Reserve, there were 6,065,000 working age Americans unemployed last May. According to the same Fed, another category of 95,915,000 working age Americans are not “officially unemployed” because they are considered to be “not in the labor force”. When you add 6,065,000 and 95,915,000, there are 101,980,000 working age Americans that didn’t have a job last month. That’s an all-time record high; higher than it was during the last recession, when the number of working age Americans without a job never surpassed 100 million. According to John Williams, the unemployment rate is actually 21.5%. All of the US’s long-term financial imbalances have continued to get worse since the last recession. In 2016, Donald Trump promised that he could rid the US national debt of $19 trillion debt in 2 terms as president "over a period of eight years". Trump warned that the US is "sitting on a bubble right now that's going to explode". 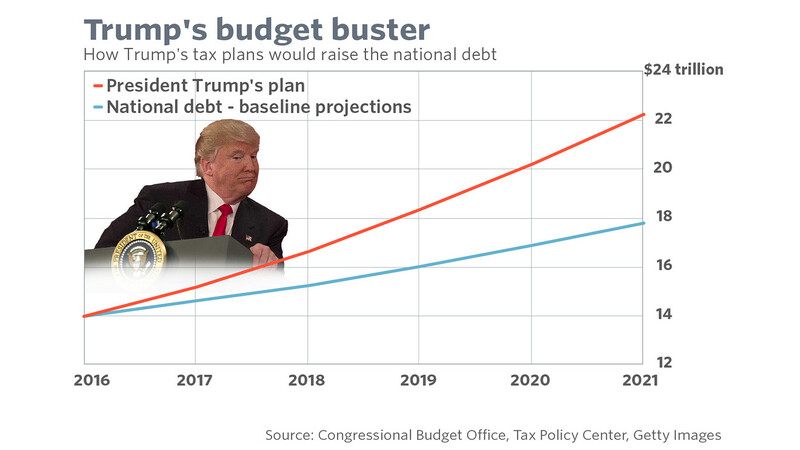 His “new” budget plan looks more like a ballooning deficit, that will likely swell debts and deficits. According to Goldman Sachs, the budget bill will increase the US deficit by $1.1 trillion next year. At more than $20 trillion, greater than the annual GDP, the United States' debt is already at its highest level since World War II. Because of the December tax cuts, of which the wealthy profit most, the federal revenues are cut by $1.5 trillion over 10 years. There is a $1.5 trillion plan to upgrade the nation’s infrastructure. The budget deal calls for an additional $300 billion in defence spending over 2 years. We're going to have the strongest military we've ever had, by far. In this budget we took care of the military like it's never been taken care of before. After the peak in the deficit in the wake of the 2008-2010 recession, President Barack Obama’s administration reduced the deficit from 9.8% of GDP in 2009 to 2.4% by 2015. 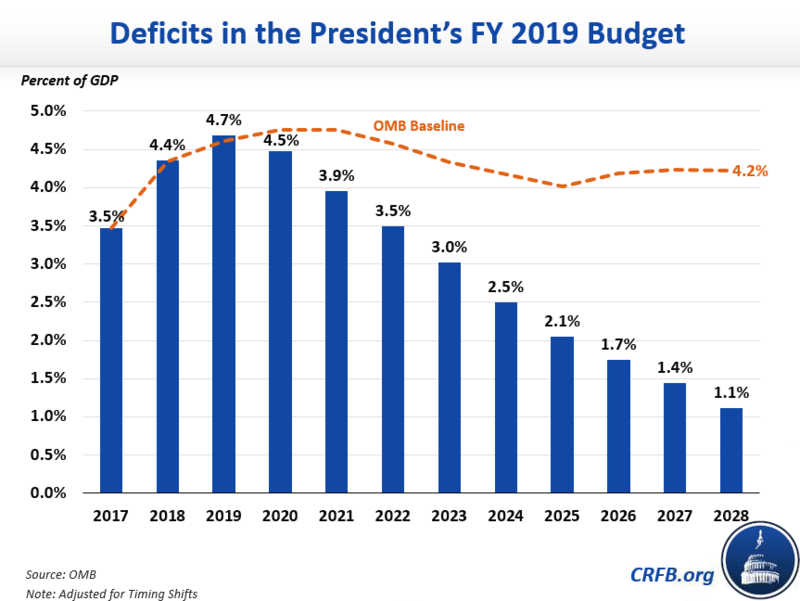 After it reached $666 billion in the 2017 fiscal year, the deficit will likely hit $1 trillion in 2019. The bubble hasn’t only been inflated by the low interest rates, but since the beginning of 2015 also by the low oil prices (normally the low interest rates, would support a higher oil price). Oil prices jumped by more than 5 percent on Monday after the United States and China agreed to a 90-day truce in a trade dispute, and ahead of a meeting this week of the producer club OPEC that is expected to agree to cut supply. U.S. light crude oil CLc1 rose $2.92 a barrel to a high of $53.85, up 5.7 percent, before easing slightly to around $53.50 by 0830 GMT. Brent crude LCOc1 rose 5.3 percent or $3.14 to a high of $62.60 and was last trading around $63.15. Just a combination of rising interest rates and oil prices could be enough. According to financial “experts” inversion of interest rates (that is: higher interest on short-term loans than on long-term loans) is a reliable “recession indicator”. In the past inversion of interest rates has frequently preceded a recession. Most interest rates haven’t inverted (only the 3-5 yield); the “most important” relationship — between the 3-month and 10-year government notes — is not inverted. The best signal of a coming recession is when a bulk of the yield spreads have gone negative simultaneously. When that happened it usually took several months before the economy actually slipped into recession. You should look at the trend of the data which looks like the inversion of other interest yields could happen soon. The rate on the 2-year has already jumped above the shorter-term 5-year note, a move that suggests the ‘economy is poised to weaken. Back in early October, the Dow Jones hit an all-time high of 26,952, but on Monday it closed at only 23,593. On Monday, the Dow Jones Industrial Average lost another 507 points, and it is now down more than 1,000 points from Thursday’s close. The Russell 2000 is often an early indicator of where the rest of the market is going, possibly the Dow and the S&P 500 will fall a lot farther. US stocks have not fallen this dramatically in December since the Great Depression of the 1930s (that lasted the whole decade). Trillions of dollars of paper wealth has disappeared, and hedge funds are expected to go down like dominoes. Earlier today, the New York Post described this as: “The stars of the biggest hedge funds are losing their shirts as analysts fear a major financial wipeout is imminent”. Member of Skull & Bones, Treasury Secretary Steven Mnuchin, who has previously worked for Goldman Sachs, George Soros and Sir Leonard Blavatnik on Sunday increased the panic by announcing that he spoke with CEO’s of the 6 largest American banks: Brian Moynihan of Bank of America; Michael Corbat, Citi; David Solomon, Goldman Sachs; Jamie Dimon, JP Morgan Chase; James Gorman, Morgan Stanley; and Tim Sloan of Wells Fargo. Media outlets labelled this as creating the “plunge protection team”. Predictably on Monday, the Dow Jones lost another 650 points (2.9%); the worst Christmas Eve trading day on record. The S&P 500 index slid 65.5 points (2.7%), the Nasdaq lost 140.1 points (2.2%), and the Russell 2000 index lost 25.2 points (2%). Technology stocks, health care companies, and banks took some of the heaviest losses in the sell-off. The dollar fell from 111.3 yen on Friday to 110.5 yen and the euro rate went from $1.137 to $1.142. France’s CAC 40 fell 1.5%, while the British FTSE 100 index slid 0.5%. South Korea’s Kospi dropped 0.3% and Hong Kong’s Hang Seng lost 0.4%. Australia’s S&P ASX 200 increased with 0.5%. Germany’s DAX and the markets in Japan and Indonesia were closed. For some time I´ve been expecting that this month, March 2019, the collapse will be staged, for no other reason than the Brexit hysteria. A couple of days ago it was reported that, "the US economy has seen the biggest one-month surge in recession risk in three decades”. The probability of a contraction in the US has jumped from 24% in December to 73% this month, accordig to a model by UBS. The sudden surge is caused by consumers facing higher credit costs, credit card rates have hit their highest level in decades, which has resulted in a collapse in spending on durable goods like cars, furniture and kitchen appliances, the “strongest recession predictive power”. Another story to cause panic is that the US trade deficit has grown from $502 billion in 2016, to $552 billion in 2017, and $621 billion in 2018, an increase of $119 billion (24%) in only 2 years, and the largest deficit since 2008. The deficit for Goods has increased $140 billion from $751 billion in 2016 to $891 billion in 2018. While Trump’s reported goal for the trade war was to reduce the trade deficit, Trump's tariffs may actually be helping to drive the deficit increase.